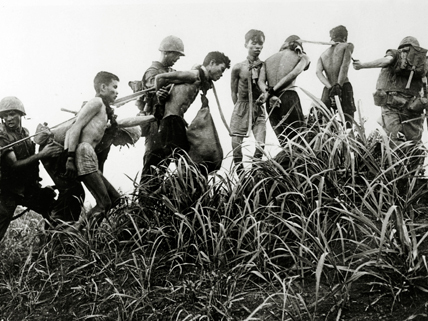 U.S. marines lead captured and bound Vietcong near Da Nang, South Vietnam, March 1965. January 27, 2013, marked 40 years since the ceasefire that ended U.S. military involvement in Vietnam. Countless books and movies have told grim stories of the war in Southeast Asia—America’s “longest war,” until Afghanistan. But are there yet new lessons to learn about Vietnam? Sadly, yes—according to “Kill Anything That Moves”: The Real American War in Vietnam, a shocking new study of systematic atrocities by the U.S. military by Nicholas Turse. Based on declassified documents and interviews with more than 100 veterans, Turse uncovers the untold brutality of the U.S. war strategy. The author relates how, in the “fog” of counterinsurgency warfare, U.S. military leaders developed an obsession with the “body count”—giving priority to the one measure that they thought would indicate whether victory was being achieved. This focus shaped military planning at every level, down through the generals and colonels directing combat operations to the “grunts” (soldiers) on the ground. Although stated goals involved “winning hearts and minds” or “pacification” of the countryside, the aim in the combat zones was simply to eliminate as many potential enemy as possible. American troops were in unfamiliar territory and faced guerrilla foes known for their tendency to “blend in” with the surrounding population. Soldiers could not easily distinguish Vietcong fighters from the Vietnamese civilians who supported them. The “official” narrative of the Vietnam War admits to at least one U.S. atrocity: the infamous My Lai Massacre, in which approximately 500 elderly men, women, and children were gunned down in March 1968. According to the sources Turse examined, My Lai was not an isolated incident, but something all too typical of the war. Whether through “search and destroy missions” or the creation of “free fire zones” for targeting by heavy firepower, American forces inflicted suffering “on an almost unimaginable scale,” he says. It is not the author’s intention to present the horrors of the war as waged by both sides, and he does not heap blame on veterans for atrocities committed. Rather, his focus is on how a terribly flawed U.S. strategy resulted in such massive civilian deaths. Listen to this radio interview with author Nick Turse about his new book on U.S. atrocities in the Vietnam War; includes transcript. Read one military historian’s reflections on the need for Americans to confront the destruction inflicted on the Vietnamese people, in light of the revelations in “Kill Anything That Moves”. This book review of “Kill Anything That Moves” puts in context the history of (under)reporting of American atrocities during the Vietnam War. Check out History.com’s resources on the Vietnam War; includes videos, speeches, and photo galleries. Thank you, soldiers, thank you.